Welcome to Ludology, an analytical discussion of the how’s and why’s of the world of board games. Rather than news and reviews, Ludology explores a variety of topics about games from a wider lens, as well as discuss game history, game design and game players. 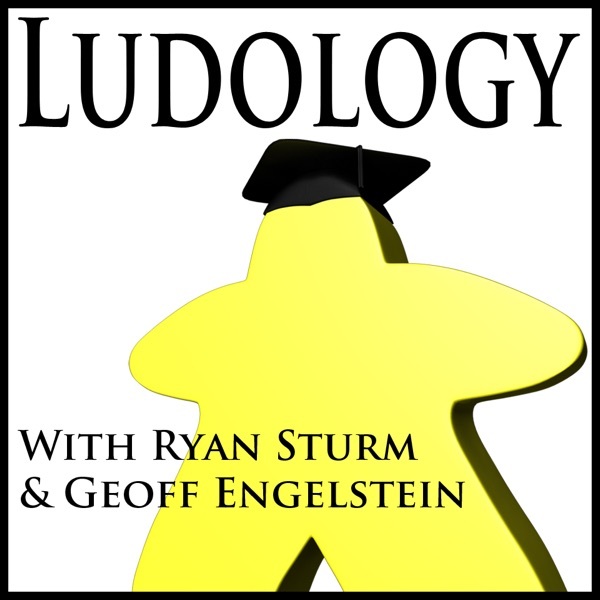 Ludology is made possible by the support and donations of listeners like you. We encourage you to visit us at our guild on Boardgamegeek to get involved in a continuing discussion of our topics. Ludology is part of The Dice Tower Network, the premier board game media network. In this classic GameTek Geoff looks at how choosing a color may affect how you play. Mike and Geoff discuss multi-use cards - their history, and how they can be used by designers. Mike and Geoff are pleased to welcome returning guest Stephen Buonocore of Stronghold Games to discuss the state of the gaming industry going into 2017. In this classic GameTek Geoff pays tribute to game theorist John Nash. Ludology Episode 143 - Two Players! Three Players! Four Players! Bwahahah! How do different player counts affect the design process? How important is it that a game support a variety of player counts? Mike and Geoff are pleased to welcome special guest Jamie Madigan, author of the Psychology of Video Games blog, and author of the just released Getting Gamers. Our topic is Avatars, and player representation in games. How does the role we take on in a game affect our experience and behavior? In this classic GameTek Geoff takes a look at the math behind the popular game Werewolf. How do you decide what games you want to publish? With the myriad of pitches and submissions that publishers receive, it is vital for designers to understand what attracts someone's eye. New Content! Geoff interviews Barry Joseph and Eric Teo about the game Gutsy. Barry is the Associate Director of Digital Learning at the American Museum of Natural History in New York City, and as part of a new exhibit on the human microbiome the team at AMNH worked with Eric Teo, to develop the card game Gutsy. Many of you know Eric Teo as the host of the Push Ur Luck Podcast, and he is also a graduate student studying game design at the NYU Game Center. Why do a card game? What do they hope to teach, and what other roles do games have to augment museum exhibits? A Print & Play copy of Gutsy can be downloaded at the AMNH website! Mike and Geoff take a look at "Take That" games. When does this mechanic work, and when does it fail? In this classic GameTek, Geoff talks about the revolutionary studies about the human microbiome, and what that can teach us about playing and designing games. What changes are usually made between a first and second edition of a game? And what does that teach us about the design process? Mike and Geoff are joined by guest Paul Grogan, who was heavily involved in the new edition of Through The Ages with CGE, to examine these questions. And since we're talking about Through The Ages, we had to invite Ryan Sturm to come back for an encore visit to the program. In this classic GameTek Geoff looks at memory, and how games work with or against it. Mike and Geoff are pleased to welcome pinball game designer Keith Johnson, designer of games such as Simpsons Pinball Party, Revenge From Mars, and Lord of the Rings. What are the special design techniques used for designing a pinball game? How do you keep players engaged? How do you make the fixed physical layout feel different in different modes? In this classic GameTek, Geoff talks about luck and what increases or decreases it. Mike and Geoff are pleased to welcome guest Richard Borg to discuss the art of designing war games with mainstream appeal. Mr. Borg is the designer of the Command and Colors series of games, which includes Memoir 44 and Battlelore. What are the features of an entry-level wargame? How can you simplify but still capture the essence of a battle? In this classic GameTek, Geoff talks about making the player feel powerful. We also launch our part of the big Dice Tower Network contest! Mike and Geoff open up the mailbag and answer difficult and interesting listener questions! In this classic GameTek, Geoff takes a look at the debate that raged in the 1990's between Narratologists and Ludologists. Geoff is pleased to welcome Scott Rogers, designer of video games such as Darksiders and God of War, and author of the books Level Up! and Swipe This! The discussion centers around the concept of a 'level' as popularized in video games. Why is it such a popular way to organize games? What advantages does it give the designer? And what is the analog in the boardgame world? In this classic GameTek, Geoff looks at how a good analogy can dramatically simplify learning a game. Mike and Geoff take a deep dive into the Antoine Bauza game Seven Wonders. What works? What doesn't? What drove the design decisions? In this classic GameTek, Goeff talks about how innovative a game can really be. In this classic GameTek, Geoff discusses a game designed to explore the relationship between rules and morality. Inspired by an article by Matt Thrower, Mike and Geoff talk about games that try to tackle controversial topics, and why there aren't more of them. In this classic GameTek, Geoff takes a look at what factors make a game 'mean'. Mike and Geoff are joined by guest Rich Sommer, host of the Cardboard! podast and star of stage and screen to discuss games receiving mainstream acceptance. Is it good for the hobby to have games go mainstream? If so, what can designers, publishers, and hobbyists do to make that happen? In this classic GameTek, Geoff takes a look at an ancient text that lists games that will distract you from achieving enlightenment. Mike and Geoff dive deeper into the world of cards. What is a card? What tools do cards give the designer? What card games exhibit great depth? For their 100th episode, and Ryan's last, the guys take a look back at their favorite moments from the show. In this classic GameTek, Geoff discusses the legacy of Allan Calhamer and his game, Diplomacy. Ryan and Geoff talk about Gamification, the application of gaming techniques to real world tasks. Why do it? What are some good and bad examples? In this ALL NEW GameTek, Geoff interviews Dr. Michael Bowling of the University of Alberta. Mike and his team put together computer hardware and software to 'solve' Heads-Up Limit Texas Hold'Em. So how does it work? And what does 'solve' really mean in a game with so much hidden information? Ryan and Geoff are thrilled to welcome Richard Garfield, designer of Magic: The Gathering, Robo Rally, Netrunner, King of Tokyo and more, along with bonus guest Mike Fitzgerald, whose latest designs include Diamonds and Baseball Highlights: 2045. We discuss Richard's design philosophy, the origins of Magic, types of gamers, and much more. Please also visit our geeklist to share your memories of Ludology for our 100th episode spectacular! In this classic GameTek, Geoff looks at a curious incident at Johns Hopkins University. Ryan and Geoff discuss heuristics, and the way they are used in games. How can designers shape a game's heuristics to increase both depth and accessibility? In this classic GameTek, Geoff discusses the many instances of people cheating in chess tournaments. In this classic GameTek, Geoff discusses Reputation as an antidote to Cheating, and how it breaks down as groups grow in size. Ryan and Geoff are thrilled to welcome Ben Brode, Senior Game Designer for Hearthstone, the online card game from Blizzard Entertainment. Ben joins us to discuss the design considerations behind Hearthstone, how they took advantage of the digital medium while still feeling like a physical card game, and why you should deliver pizza to your favorite game studio. In this classic GameTek, Geoff begins a two-part exploration of cheating with a personal admission. In this classic GameTek, Geoff discusses a study done on playing Rock, Paper, Scissors with one player blindfolded and one able to see. Who comes out on top? Ryan and Geoff are pleased to be joined by Travis Chance and Nick Little of Action Phase game, designers of Heroes Wanted. This was the first time Action Phase has exhibited at Gencon, and we discuss what it was like. When did they get their booth? How much planning did they do? What was the total cost to do the show? What worked and what didn't? In this classic GameTek, Geoff discusses Artificial Intelligence, and how it affects our play. Ludology Episode 87 - Come On Down! Geoff finally acquiesces to Ryan's wish to discuss game shows. And you know what? It turned out to be a very fertile area for analysis. What special considerations are there for game shows? What can game designers learn from them? Ryan and Geoff dip back into the mail bag to respond to more listener comments and questions about luck and randomness. In this classic GameTek, Geoff discusses brain imaging studies on shogi players. For images relating to this story, check out Geoff's blog entry on BoardgameGeek. Ryan and Geoff are joined by guest Gil Hova, designer of Prolix and Battle Merchants to discuss playtesting. What are the different types of playtests? How do you get the most out of your testing? What should you look for in testers? NOTE: This is a revised version of this episode that corrects the audio issue. In this classic GameTek, Geoff discusses tournament structure in sports, and the way that may effect the play of the individual games. Ryan and Geoff do a deep dive into the world of Worker Placement games. What makes them tick? Why would designers use that mechanism? What are the pitfalls to avoid? In this classic GameTek, Geoff talks about how games can teach us about economics. Ryan and Geoff are very pleased to welcome Dominic Crapuchettes to Ludology! We discuss designing party games, dealing with mass market retailers, starting a game company, and their recent pivot into the strategy market with Evolution. In this classic GameTek, Geoff talks about shuffling, big numbers, uniqueness, and the origin of life. Ryan and Geoff respond to a random sampling of the listener questions about luck and randomness. Thanks to all who sent in your thoughts, comments, and questions! In this classic GameTek, Geoff discusses the psychological property called Competence, and how you can use it to annoy people. Ryan and Geoff take one last look at the Most Influential Games of the 20th Century. Do they have any second thoughts? Any overlooked games that should have been included? They also put on their pointy prognosticator caps and give their picks for the top 10 games that will be most influential on the 21st century. In this classic GameTek, Geoff talks about recent research on willpower. Ryan and Geoff are pleased to welcome back Eric Zimmerman, professor at NYU's Game Center and author of The Rules of Play. This episode we discuss the concept of the "magic circle" and how designers can foster and benefit from it. In this classic GameTek, Geoff talks about the state of game criticisim. Ryan and Geoff conclude their survey of the most influential games with the 90's. Which games have cast shadows into the 21st century? Ryan and Geoff are very excited to be joined by special guest Mike Gray. Mike has a long history in the game industry, working for Milton Bradley, TSR, and Hasbro. He designed Fortress America, Shogun, The Omega Virus, and many other classics during his tenure. Mike gives us a fascinating glimpse into the world of the largest game publisher, including the genesis of the Gamemaster series, acquisition of Avalon Hill, and development of modern classics like Queen's Gambit. In this classic GameTek, Geoff discusses the importance of endings, and the difference between "the experiencing self" and "the remembering self." Ryan and Geoff continue their series on the most influential games of all time, and take a look at the 1970's. What were the key moments in the decade of disco? In this classic GameTek, Geoff talks about Power Creep. Is it a big conspiracy? Or is there a less nefarious explanation? Ludology Episode 71 - Dude, Where's My Map? Geoff and Ryan are joined by Steve Kendall of the Ragnar Brothers and designer of History of the World, Viking Fury, and more, to discuss Area Control or 'Dudes on a Map' games. What are the outstanding examples? What are the key ingredients of this genre? What are the strengths and weaknesses? NEW CONTENT! Geoff talks with Quintin Smith of Shut Up and Sit Down about his recent experience at The Betrayer's Banquet, a Prisoner's Dilemma-themed dinner party. Does backstabbing improve the taste of chicken feet? Ryan and Geoff are joined by Rob Daviau, of Iron Wall Games, and formerly with Hasbro. While at Hasbro Rob worked on a slew of games you know, including Heroscape, Betrayal at House on the Hill, and Axis and Allies. But we've invited him on to discuss his 'Legacy' series of games, starting with Risk: Legacy, and the upcoming Seafall. How did he come up with the idea for Risk: Legacy? What were the design challenges and blind alleys he overcame? What is he trying to do differently with Seafall? In this classic GameTek, the GameTek players present "Wild West Showdown". Who will win this three-sided gunfight... of doom? Hot on the heels of talking about Set Collection, Ryan and Geoff tackle its cousin, Area Majority, a mechanic which comes wearing many disguises. How does it differ from Set Collection? What makes it work or not? In this classic GameTek episode, Geoff talks about gamification, specifically the way that it is used by fold.it to use game mechanics to solve real world problems. In this episode Ryan and Geoff discuss Set Collection as a tool for game designers. What attributes can set collection add to a game? What are some of the pitfalls? What games have used it well or badly? In the classic GameTek, Geoff talks about Chaos Theory, and how it is reflected in game design. In this episode, Geoff interviews Frank Merrick from FIRST about using games to get kids excited about science and technology. What are the special considerations when designing a game to be educational, fun, and challenging? In this classic GameTek, Geoff talks about two recent research results about choice. Ludology Episode 66 - Please Sir, Can I Have Some More? Ryan and Geoff are joined by special guest Corey Koneiczka of Fantasy Flight Games designer of such classics as Battlestar Galactica, Mansions of Madness, and the upcoming Eldritch Horror. The topic? Expansions! Are they good or bad for the industry? Do you design a game with expansions in mind or bolt things on afterwards? What are the do's and don't's of expansions? This episode of Ludology is sponsored by Scott King Photography, for all of your game photographing needs! How are dice and planets connected? Listen to this classic GameTek and find out! Ludology Episode 65 - The Envelope Please! Ryan and Geoff dedicate the entire show to reviewing their top 10 entries to the Dice Tower Network / Cool Stuff Inc contest, and announce the winner! In this classic GameTek, Geoff explores fuzzy logic and how it applies to our attempts to categorize games - and everything else in the world. Ryan and Geoff are joined by guest Mike Fitzgerald. Mike is the designer of a variety of card games including the Mystery Rummy series and Hooyah, but also spent many years working on CCGs like Wyvern, Magic, and Pokemon. Mike joins us to discuss the early history of CCGs, how they changed the gaming industry, and what special design techniques are required for the CCG and LCG arenas. This episode of Ludology is sponsored by Nations, the new publication from lautepelit.fi. Nations will be released at Essen 2013. In this classic GameTek, Ryan and Geoff interview game designer Bob Abbott, designer of classic games like Confusion, Eleusis, and Code 777. Ryan and Geoff take a very high level look at the structure of games - the phases and turns that make them tick. What structures were there in ancient games? How has this changed over time? How does the structure selected by the designer influence the game experience? We also launch our portion of the big Dice Tower Network contest! Big prizes at stake! In this classic GameTek, Geoff shares a technique for making it simpler to calculate probabilities in your head. Ryan and Geoff are joined by John Meindersee of Campfire Creations, to talk about the special challenges in creating digital versions of boardgames. Campfire Creations developed the iOS version of Stone Age, and John shares the details of the challenges and opportunities that presented. Meaningful decisions are what drive deep strategy games. But can there be too much of a good thing? Can having too many choices hinder our ability to make good, or any, decisions? In this third listener question episode, Ryan and Geoff respond to a veritable panoply of user questions, and field them with their usual combination of aplomb and pithy aphorisms. In this classic GameTek, Geoff talks about PokerBots: How they are programmed, why they're a problem, and how to detect them. Ludology Episode 60 - How To "How To Play"
Rules! Every game has them, but they are a big source of gamer frustration. Ryan and Geoff put their heads together to come up with rules for rules. What makes for a good set of rules? What are common pitfalls? How should they be structured? What should be highlighted? In this classic GameTek, Geoff talks about the difference between playing a human vs an AI opponent. Do we act and feel differently about the game? If so, why? Ludology Episode 59 - Hey! That's Mine! As humans we overvalue losing something and undervalue gaining it. This is called Loss Aversion, and is a well studied psychological effect. How do games incorporate Loss Aversion? How does it affect us as players, and how can game designers use it to create a more emotional and engaging experience? When can Loss Aversion hurt a game rather than help it? Ludology Episode 58 - Back to Basics? Ryan proposes a radical change to the mechanics of Trading in the Mediterranean to simplify and smooth our the gameplay, and Geoff wants to talk about it. Will it throw the baby out with the bathwater? What is the heart of the game? In this classic GameTek, Geoff takes a look at car washes and the Endowed Progress Effect. How can we use it to get players more engaged in a game? Ludology Episode 57 - Goal! Ryan and Geoff tackle the concept of an 'objective' in a game - not just end game objectives, but techniques for building a series of mini-objectives to keep the player engaged and the game moving forward. What types of objectives work well? What is the difference between public, private, and hidden objectives, and how do those interact? In this classic GameTek, Geoff talks about how businesses are trying to use games to appeal to customers. Licnesed games like X-Wing and the upcoming Star Trek: Attack Wing are hugely popular. But how is designing a game with a license different? Ryan and Geoff are pleased to welcome back guest Andrew Parks to delve into these questions. Andrew is the designer of a wide variety of licensed games, including The Nightmare Before Christmas TCG, 300, Hogwarts House Cup, Hunger Games District 12, and the upcoming Star Trek: Attack Wing. How do you invoke the theme of the licensed property? Does it make game design simpler or more challenging? How much is dictated by the licensing company? Answers to all of these questions, plus tons of spoilers about Attack Wing and a very special Core Worlds reveal! In this classic GameTek, Geoff looks at intransitive dice - Dice where die A tends to beat die B, which tends to beat die C, which tends to beat die A. This was a big topic of discussion on the Dice Tower form when it was first released, so please continue the conversation over on the Ludology forums! Ryan and Geoff reivew the status of "Trading in the Mediterranean", their publicly-developed board game. After talking about the current version and how it has evolved, they talk about what's working and what's not, and how to fix it. This episode of Ludology is sponsored by Sissyfight 2000, now on Kickstarter! In this classic Gametek, Geoff talks about Entanglement, Quantum Mechanics, and why our intuition about probability can be woefully incorrect. One of Geoff's favorite episodes! Ludology Episode 52 - Let's Make a Deal! This episode Ryan and Geoff tackle games that feature negotiation, either as a designed-in feature, or a by-product of the player interactions. What features make for a great negotiation game? What types of player experiences can they engender? Can Ryan get Geoff to agree to anything? In this classic GameTek, Geoff examines regret - why we would rather not make a choice at all, rather than make it and have it not work out. Ryan and Geoff return with the second half of their new games for 2012. Plus their top picks for the year! This episode is sponsored by the game Influence, now on Kickstarter! In this classic GameTek, Geoff introduces the Monty Hall problem, an old chestnut that never fails to amaze those who have not heard it before. To celebrate the 50th episode of Ludology, Ryan and Geoff talk about 50 games that were new to them in 2012: The good, the bad, and the design features that stood out. In this classic GameTek, Geoff talks about Martin Gardner, who wrote the Mathematical Games column for Scientific American magazine from the mid 50's to the 1980's, and passed away in 2010. Ludology Episode 49 - The Joke's On You! Ryan and Geoff are joined by guest Zack Johnson, designer of the online game Kingdom of Loathing, to discuss the use (and misuse) of humor in games. How is humor used in games? Are there special considerations for making a game funny? Is Geoff capable of telling a joke? In this classic GameTek, Geoff takes a close look under the hood at the Reiner Knizia game High Society, to tease out what makes it such a dynamic and engaging design. No, not listener feedback - Feedback loops. What are the different types of feedback, and how do designers incorporate them into games? Do certain types of games benefit from feedback? Is feedback necessary for a rich game experience? In this GameTek from 2010, Geoff and his son Brian talk about what they are worried about as their game The Ares Project nears publication. Special bonus recap of how on target we were! In our first episode of the new year, we are joined by the godfather of gaming, Tom Vasel, to dissect 2012 and speculate on the direction of the industry in the upcoming year.